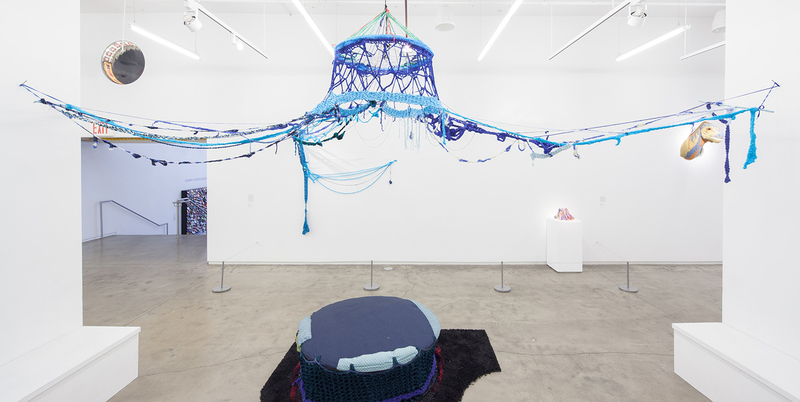 When you kick back on the blue pouf in the west side of our gallery, you are rewarded with a wonderful view of the woven and knitted works in Sew What? Robb Putnam’s dystopic Disney dog named Dunderhead peeks around the corner, Nathan Vincent’s impressive crocheted Army Man crouches nearby, and Susan Beallor-Snyder’s twisted rope sculpture Broken clings to the wall. 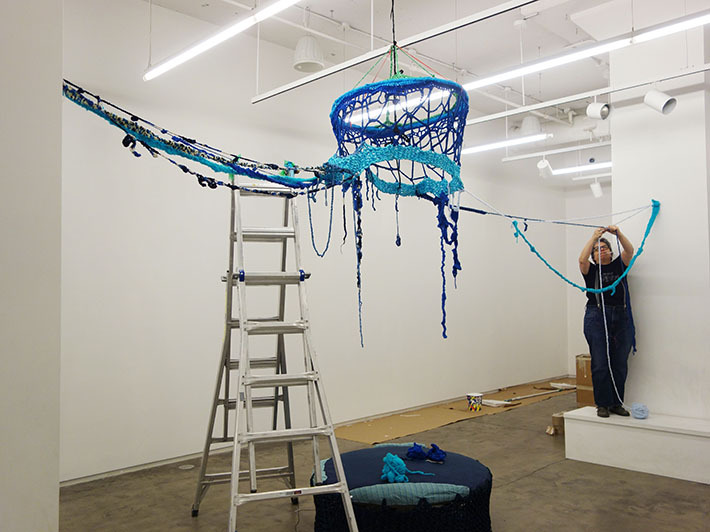 Up above, Sheila Pepe has woven a canopy of blue yarn and thread to create A Place for Looking and Dreaming, and as its name implies, the work is perfect for just that. 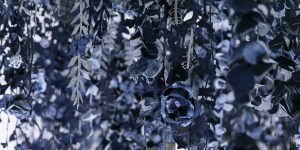 For more than 25 years, Sheila Pepe has been working with textile-based materials to stitch complex and usually site-specific installations. “I stitch, and I say I stitch because there are stitches in hand sewing, there are stitches in knitting, and there are stitches in crocheting. 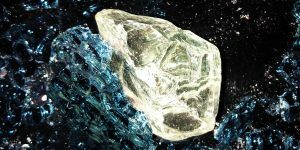 Stitches are the common denominator,” she said. 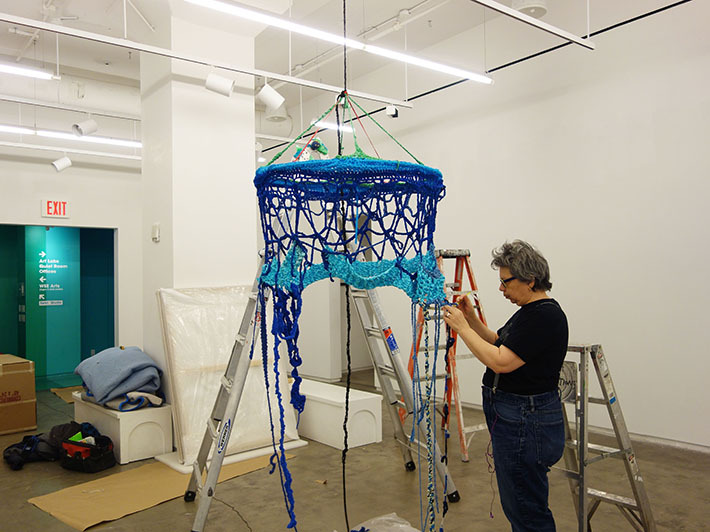 For this installation, Sheila stitched her work between two columns in the gallery, creating an overhanging sculpture with icy blue and cerulean yarn. A Place for Looking and Dreaming is an open ended piece, and Sheila hopes visitors will take away their own interpretations. Next time you are in the gallery, lounge for a bit and take in the work around you. Some young visitors have said her piece reminds them of a basketball hoop, an octopus, and an intricate spiderweb! 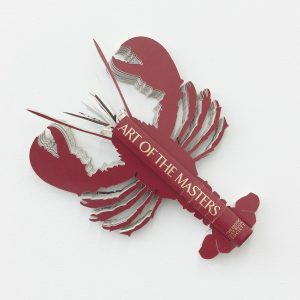 Get to Know Artist Brian Dettmer!